Restaurants always seem to have the upper hand when it comes to dips and sauces, and the store-bought renditions never seem to taste quite as good. Here’s some good news: You no longer need either, because now, you can make a classic Honey Mustard Dressing as good as your favorite restaurant. One that’s perfect for both drizzling and dipping. This Honey Mustard Dressing Recipe is sweet and tangy perfection, and it all comes together in 2 minutes or less. WHAT’S IN HONEY MUSTARD DRESSING? 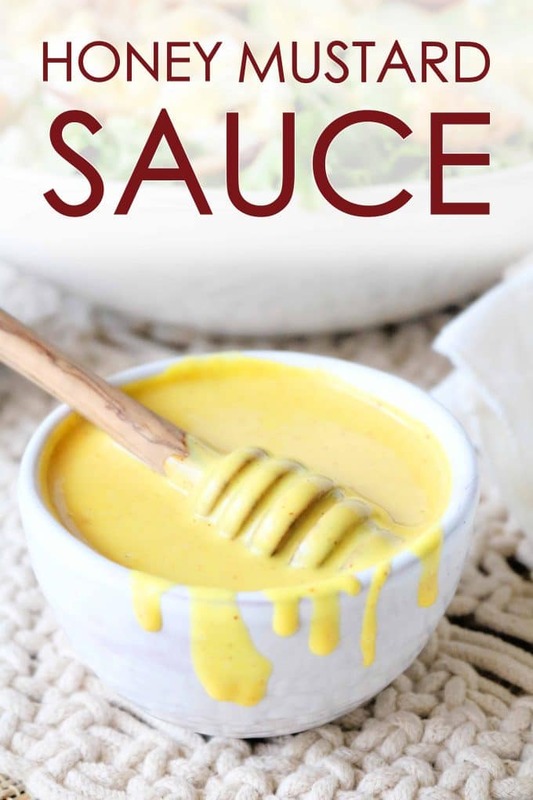 Honey Mustard Dressing is a creamy condiment used for topping all kinds of salads, sandwiches, and of course, for dipping. It’s on the menu at just about every salad-serving restaurant and on the condiment aisle of every grocery store, but nothing compares to a homemade rendition. It’s made up of three main ingredients, two of which will not surprise you at all — honey and mustard. 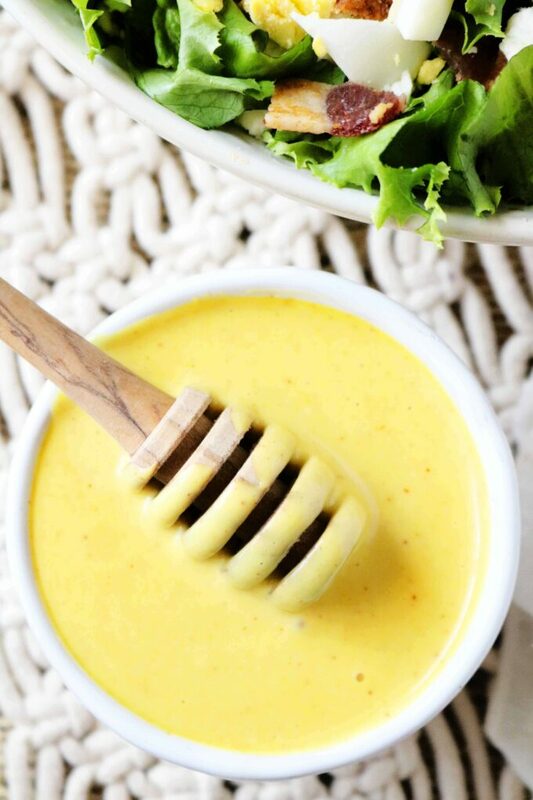 For a classic Honey Mustard Dressing, you’ll want to go with plane Jane yellow mustard. The last ingredient, however, might be somewhat of a revelation to you. It’s mayonnaise. Mayonnaise is what gives a classic, restaurant-style Honey Mustard its creamy consistency, making this dressing perfect for both topping a salad or for dipping. In addition to the 3 main-stays, a pinch of salt and a little cayenne is the only seasoning you’ll need. The cayenne is optional, but it does add a nice kick to the dressing. Measure out the mayonnaise, honey, and yellow mustard. Yes — it’s really that easy. All you have to do is measure your mayonnaise, honey, and yellow mustard and add them to a bowl. Season with a pinch of salt and cayenne pepper for a touch of heat, and that’s all there is to making this beloved salad topper. Recipes do not get a whole lot easier than this, folks. IS HONEY MUSTARD GOOD FOR YOU? 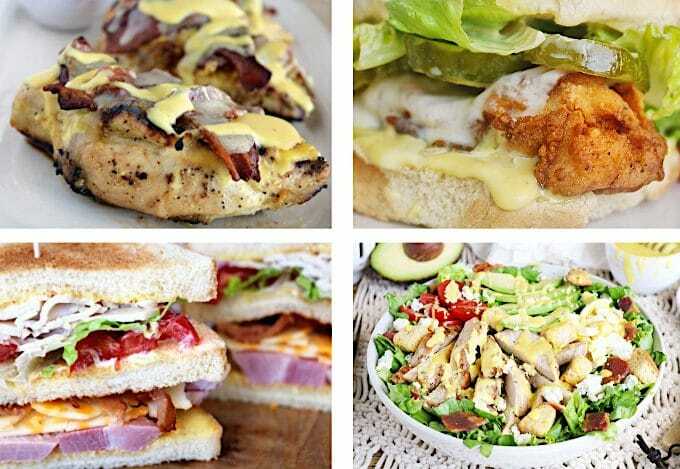 While Honey Mustard Dressing is both gluten-free and dairy-free, it may not necessarily be the healthiest of choices. It is mayonnaise-based after all. It weighs in at about 276 calories for a 3 tablespoon-sized serving. If you’re looking for a sweet dressing on the healthier side, you might want to try a vinaigrette instead. However, everything in moderation, and this Honey Mustard Dressing is a small indulgence well-worth taking. DRESSING, DIP, OR SAUCE — YOU CHOOSE. Honey Mustard is one of my personal favorites, and in our home, we use it a lot. My oldest daughter requests it every time we serve baked chicken tenders, and we actually got her to try a salad for the first time thanks to a drizzle of homemade Honey Mustard Dressing. It’s quick to make, extremely versatile, and better than any store-bought rendition. Guaranteed. Pleaes, enjoy! Easy Ranch Dressing features the perfect blend of mayonnaise, sour cream, minced garlic and a simple mix of herbs and spices. It’s perfect on top of a Classic House Salad…or anything with lettuce, really. 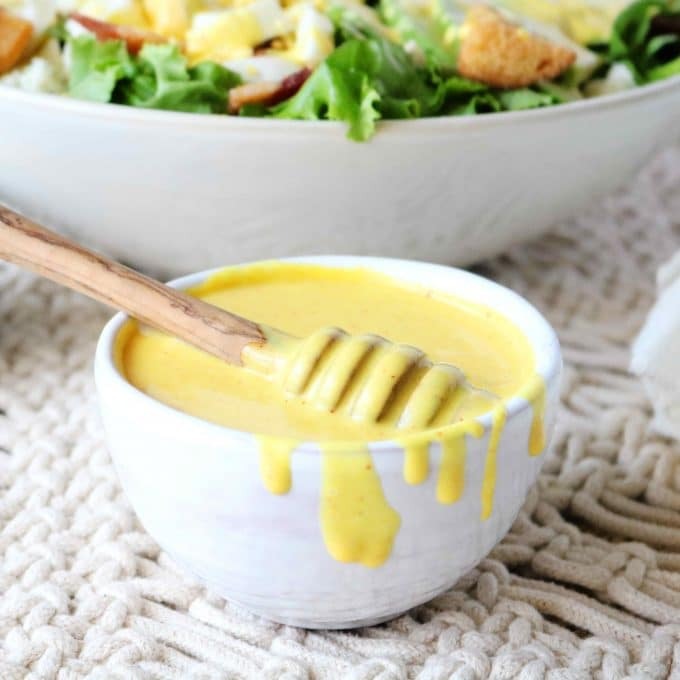 Two minutes and a few ingredients is all you need to make this classic, restaurant-style Honey Mustard Dressing featuring mayonnaise, honey, and yellow mustard. In a small bowl, combine the mayonnaise, honey, mustard, salt and cayenne. Whisk until well blended and serve. For a thinner dressing, add 1 tablespoon of water and stir until it has reached the desired consistency. I’m obsessed with the color of this!! I love honey mustard dressing, but have never thought to make my own. Since I don’t really like to buy salad dressings, that just means I haven’t had it in a while. I need to change that! My mom, sister and niece love honey mustard. I will have to make this for them. 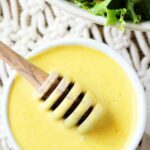 Honey mustard dressing is one of my absolute favorites! I love how easily it comes together. Definitely need to try this at home some time. Ha! Me too 😉 So much better than sacrifice! HA! Honey mustard is one of my fav dipping sauces. Can’t wait to try this! I love honey mustard dressing! It’s my favorite dressing to order at restaurants, but I never thought about making it at home. Looks so easy! Honey Mustard Dressing is one of my favorite dressing. Looks easy. Would love to use this dressing on my Chicken Drumstick Platter this weekend. Homemade dressings are always better, and I really love honey mustard! Can’t wait to make this! Wow I never thought of adding mayo, I usually just combine honey and mayo, I’ll have to give this version a try. Thank so much for posting this recipe. I buy this dressing from the store all the time, so it’s good to know I can make a better version at home in 2 minutes. Homemade dressings are always great. thanks for sharing the recipe from scratch. I have not yet started making them at home. so bookmarking. Pass the chicken fingers – this sauce is calling!! I love honey mustard for a dressing but my favorite is for dipping too! Honey mustard is my favorite dipping sauce!!! SOOOO GOOD! 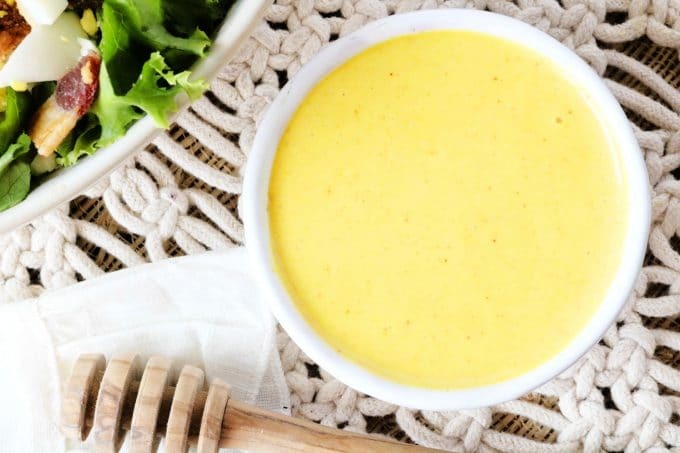 Nothing like a homemade dressing, your version for honey mustard sounds delicious and looks so creamy. Need to try it at home as I know it will enhance my meals.